footsteps and is majoring in chemical engineering. Shuffling from class to class, burning the midnight oil on that lab report, working one’s way through school to earn money. Sounds like the life of a college student, right? Well, try doing all of that at 37… with a daughter… and after tragedy strikes. Shane Burns, senior in chemical engineering, sounds like the typical college student: works hard, studies endlessly and attends class. Burn’s backstory, however, is one that is considered rare for anyone, especially someone in college. Burns was born and raised in a middle-class family in Mobile, Alabama, attended LeFlore Magnet High School, and was naturally gifted in math and science. He even graduated among the top 10 in his senior class. After graduating, Burns attended one semester at the University of South Alabama, but left because of the one thing always on his mind: making money. He did begin to make money by working at the local Blockbuster, where he eventually became the store manager. At 19, Burns became a father to Mikayla, and continued working at Blockbuster until 23. 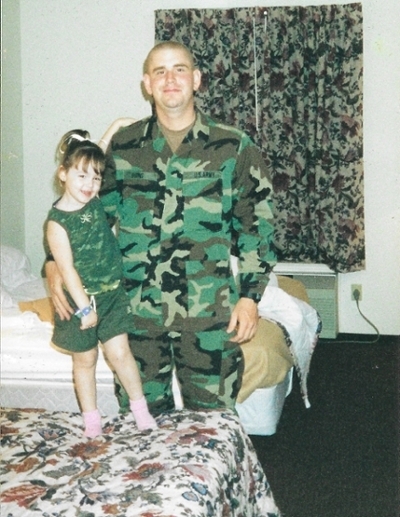 Upon reassessing where he was at that stage in life, and realizing he needed to be the role model Mikayla expected and deserved, he enlisted in the Army, which he proudly served for five years. After Burns returned from the Army, he again questioned his purpose and what he was meant to do. So he returned to what he knew best: Blockbuster. He also re-enrolled at the University of South Alabama, but again only lasted a short period of time before deciding he was still not ready for academia. Burns eventually left Blockbuster for good and began a job in logistics for United Rentals. Right before he left Blockbuster, he began dating a woman, and found a renewed hope in his career and a sense of stability in his life. However, in 2009, the unthinkable happened: his girlfriend committed suicide. Before his girlfriend’s suicide Burns had been contemplating going back to school again, but never took action and kept delaying the decision. After that happened, Burns decided it was now or never. Burns attended Faulkner State Community College for two years, before transferring to Auburn in fall 2011 to obtain his ultimate goal: a chemical engineering degree. Since arriving in Auburn, Burns hasn’t looked back. While he may be a more seasoned student than others, he has made life-long friendships with his classmates (even expecting to serve as a groomsman in the wedding of one of his friends this summer), experienced the gameday atmosphere by attending his first tailgate in fall 2014, and has secured a full-time job with Chevron as a process engineer in Mississippi upon his graduation in May. But, perhaps, best of all? Mikayla is enrolling at Auburn in the fall in chemical engineering. Burns’ Auburn experience is not a typical one, and getting to Auburn and the College of Engineering seemed to be half the battle, but once at Auburn there was no denying his determination to graduate, which also included some help along the way. On May 10, Burns proudly walked across the stage to cheers from his family, including Mikayla. He claimed his chemical engineering degree, and will now begin a new stage in life that seemed so unattainable years before. “The one lesson I learned and I want to convey to others out there, especially like me, is it’s never too late to better yourself and achieve your dreams,” Burns said.